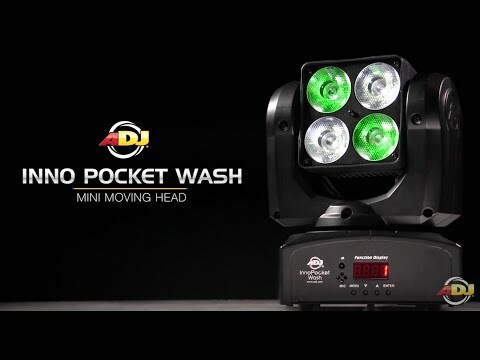 The Inno Pocket Wash is a mini Moving Head that creates beautiful washes of color with its 28-degrees beam angle. Its compact size and lightweight makes it ideal for mobile entertainers, small club and bars, roller rinks, bowling centers, churches or any mobile production. 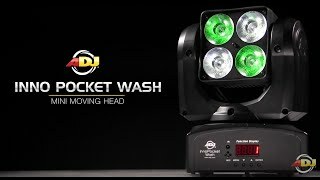 Featuring 4x 10W 4-IN1 Quad LEDs (RGBW - Red, Green, Blue and White), the Inno Pocket Wash will give pure lighting excitement with its fast moving head and brilliant washes of color. It has a pan and tilt inversion mode that makes one head do the opposite of another when linked together. Users may control the Inno Pocket Wash by Sound activation with its 12 built-in shows, the optional UC IR wireless remote, or use a DMX controller to create your own light shows. Considering purchasing the American DJ Inno Pocket Wash? Have questions? Ask people who've recently bought one. Do you own the American DJ Inno Pocket Wash? Why not write a review based on your experience with it. Great Light Fixture!!! Setting it up a bit difficult? This is a great LED Light fixture, I'm using it with My DMX 2.0 from ADJ. Just be warned that to use this Lamp in dual colour mode you need to operate it in 21 Channel mode, it comes set in 9 Channel mode. The My DMX 2.0 only ships with Mode 1 and 2 which is 9 and 11 channel respectively, I had to do a bit of digging around on the internet to find the 21 Channel SSL2 profile and also change the Lamps setting in the Menu. The supplied manual doesn't make this process very clear and it took me nearly a day to work this out :-( It's a great light once you get it set up correctly. small, ligh & affordable lights, ideal for mobile dj. easy to set up & use. thanks well happy ! Very affordable and well worth the cost of investing in these moving lights. We got 2 of these to add a bit of movement to our LED wash lights. We are Indigo Blue, a 5 piece covers band. We play a lot of weddings, parties and functions and wanted something that was easy to set up and takes care of itself. The fact that we can control them from a remote control is a real bonus. Being able to switch off the sound activation for slower songs or hit the strobe for the odd solo really adds to the show. We're thinking about getting another couple or maybe the pocket spots once these have paid for themselves. This is defiantly a pocket moving head, the colour output is very good and this fixture has great colour mixing capabilities! I highly recommend this product. Would be better if it had IEC IN and OUT. Very good idea from American DJ, a great improvement in terms of brightness from the pocket spot!! The LED's are nice and bright and the movement is very sharp and precise. Many of these on DMX close together would work perfectly and create a really cool effect!! Really recommend these!!!! Seen a video for American DJ Inno Pocket Wash online or have you own video? Check out American DJ Inno Pocket Wash on DJkit.com!